In 2015, I was invited by Ritch Calvin and Graham Murphy to deliver one of three keynote talks at the Science Fiction Research Association’s annual conference at Stonybrook University, New York. I decided I was going to base my talk on Ursula K. Le Guin’s famous story, “The Ones Who Walk Away From Omelas.” Talking to friends about it, I realized that I had a somewhat different interpretation of the story than others. Our best stories always lend themselves to multiple interpretations, but I was curious as to what Ursula herself might think of my ideas. Since I was fortunate enough to be among the many writers in whom she took an interest, I was able to discuss "Omelas" with her via email in the days and weeks preceding the conference. With characteristic generosity she not only validated my ideas but also gave me much needed encouragement. I wanted to end my talk with a wolf howl, which is not a usual sort of thing for an academic conference, but it was fully in the spirit of my topic. She told me she had once hooted like an owl during a speech at the Library of Congress, and encouraged me to go for it. So, throwing trepidation aside, I did. As is my wont, I didn’t write up my talk as a paper to read from, except for the opening words and some bulleted notes. I like to speak to the audience rather than read (that’s the standard in science conferences anyway) — but I fully intended to write up the talk more formally after the event. Ursula asked me to send her the final version, but it never got written, so I never did. In January 2018, Ursula passed away, leaving an unfillable void in literary SF and in the lives of all those she touched. So I’ve dug out the fragments of my talk, rewritten it from my notes, and added detail where it was insufficient. Except for the first few paragraphs, it is not a verbatim rendition of what I said back in 2015. I present this reprised talk as a humble tribute in memory of Ursula K. Le Guin, who taught us how to see. Greetings! I am honored and somewhat terrified to be standing in front of you. I am here wearing three hats — although I am a science fiction writer, my identity as a physicist and educator, and my journey toward transdiciplinary scholarship of climate change, are not distinct from each other. Just to be clear from the outset, I lay no claim to any but the most superficial and incomplete knowledge of literary criticism or social theories. I am honored that my work has produced at least one PhD thesis that I know of, and has enabled some folks in this room to write papers, and has given headaches to unsuspecting undergraduates. A metaphor that came to my mind as I was trying to psych myself up for this talk was this: having me here before you is rather like particle physicists at CERN in Geneva inviting a proton to deliver a keynote lecture. The proton is just happy being a proton, and it is the job of the particle physicist to divine through experiment and theory the consequences of its proton-ness. The proton, in other words, can’t tell you very much directly — you have to infer things from it. I’ll try to do a little better than the proton. The title of my talk is "Leaving Omelas: Science Fiction, Climate Change, and the Future." The theme of this conference is "Suppressed Histories, Liminal Voices, Emerging Media." I assure you that there is a connection between these things. I am going to draw on what I think is the unrealized potential for science fiction to transgress, to transcend boundaries, to examine the unexamined, to hear the unheard, to make visible the invisible. And thus we have the city of Omelas, where the people are happy, but at the cost of the suffering of a single child in a basement. Any alleviation of the child’s misery implies a cessation of the happiness of all the other inhabitants of the city. This is the axiom upon which the story turns. Much has been written about Le Guin’s story by people well-versed in literary analysis. I doubt that I can add anything new to the range of interpretations; however, I will pick up a thread and run with it in a direction I hope you’ll find interesting. I’ve always been fascinated by the people who walk away from Omelas. Clearly, they are uncomfortable with the suffering of the child in the basement. Why don’t they stay and fight the system? But it is an axiom of the story that the betterment of the child will mean the suffering of the many. While one might say that the happiness of the inhabitants of the city is a false kind of happiness, based as it is on the terrible suffering of the child, the fact is that the citizens are doing quite well, and can find ways to reconcile themselves to the situation. The people who walk away from Omelas give us a way to think differently about the psychomyth. Consider Omelas as a paradigm, which I define as a conceptual structure through which we create and make sense of the world. In that light, those who walk away do so because the Omelas paradigm allows them no agency in striving for a just and equitable social system. I’d like to think that they are walking toward other ways of being and seeing, other paradigms. Because it is clear that within the paradigm of Omelas there are no solutions. Maybe those other possibilities will eventually dismantle Omelas, replace it with a system where happiness is not a consequence of another’s misery. Perhaps the story is telling us that there is only so much you can do from within, when the paradigm itself is rotten. In fiction as in life, perhaps, this is the age of a million heroes. Omelas is not an exact analogy for our world, but there are enough similarities that it makes sense to say that we live in some form of it. Our comfort and our well-being as privileged (to some degree or another) inhabitants of the world’s richest country depend on the exploitation of not one child, but many children. Not one man or woman, but millions of them. Not one resource, forest, or animal species, but indeed of 25% of the world’s resources. Our Omelas — a modern industrial civilization that has spread globally — is based on certain assumptions about what is important in this world. It commodifies and objectifies some kinds of human and non-human beings; human relationships become analogous to market transactions. The language of the bazaar pervades everything. Former colonies, once "third-world countries" or "developing nations," are now referred to as "emerging markets" — as though millennia of history and culture are somehow peripheral. The living web of which we are a part becomes a mere “natural resource.” Today we have increasing socioeconomic inequality; sea level rise threatening the coastal areas of the world, where 50% of the population lives; suicide is the second leading cause of death among American youth between the ages of 15 and 34; and a black person is about three times more likely to be killed by police than a white person. Structures of power and control connect these apparently isolated events. Melting ice caps and social inequality are a logical end result of a paradigm based on consumption, extraction, and endless growth — one that ignores the reality that we live on a finite planet within boundaries set by the laws of Nature. We are taught to unsee the connections, to look at the world in chopped up, disconnected little pieces. Our Omelas constrains our empathic imagination to small personal circles, and to short scales of time and space. Science fiction should enable us to see structures of oppression and control, to make us aware of and question the things we normally take for granted, and to expand our imaginative reach. But more often than not, science fiction simply reflects the world in the image of the overwhelming paradigm. In April 2014, I stood at the edge of the Arctic Ocean in Alaska and contemplated the dilemma that confronts the Iñupiat Alaskans of the North Shore. The fossil fuel industry that is responsible for the global climate crisis has changed the ancestral lands of the Iñupiat forever. The melting of the sea ice has, for example, affected the migration patterns of Bowhead whales. Whale hunts are crucial for survival in the winter, but the whale itself is a sacred being in the cultural cosmology of the people who have lived there for millenia. Whale meat is never sold, always shared, and thus exists outside the mainstream economic system. Yet the same fossil fuel industry allows native Alaskans the comforts of modern living through revenues generated by oil leases. This dilemma is not limited to the Iñupiat, but afflicts all of us who live within the great behemoth that is modern industrial civilization. But our rats-on-a-treadmill lives, with their addictive, phantasmagoric distractions, don’t generally allow us to see this. In the cold, clear air of the Arctic, in the stark expanse of the tundra, in the in-between space represented by the edge of the ice, the end of the world, the boundary of the known — here, fundamental connections and contradictions became apparent. Science fiction is potentially the most revolutionary literary mode we have, because at its best it forces us to see what we don’t ordinarily see — it makes the familiar strange, and the strange familiar. The support structures, gantries, and scaffolding that hold up the paradigm that is Omelas might then suddenly become obvious to the eye. What we see, we can question, we can change. And yet science fiction doesn’t always rise to the challenge. Consider our predilection for dystopias, especially in young adult literature. It’s not that dystopias don’t have a role to play, but I find their preponderance troubling. Part of my problem is that an overwhelming number of dystopias are based on the individual pitted against a repressive society — the individual as the Lone Ranger hero, the problem solver, to triumph (or not) at the end of the tale. The trouble with complex problems like social inequality and climate change is that they require masses of people to work together. Where in science fiction are stories about people working in communities, negotiating their differences to engage with an issue? It is so much easier to write a post-apocalyptic dystopia than to imagine how we might work our way through the apocalypse together. Among the few examples that come to mind are two of Ursula K. Le Guin’s novels, The Dispossessed and Always Coming Home, and Kim Stanley Robinson’s Pacific Edge. These works aren’t blueprints for action — fiction can’t do that — but they are thought experiments that shake up the imagination, free it from old moorings, and allow us to think differently. Former colonies, once "third-world countries" or "developing nations," are now referred to as "emerging markets" — as though millennia of history and culture are somehow peripheral. It is helpful to think about how our version of Omelas has come to be. My forays into the history of science have led me to the origins of a familiar and pervasive concept that one might call the Newtonian paradigm: a view of the universe as a giant clockwork machine, entirely deterministic, predictable, and reductionist. If you have sufficient initial information, you can predict the course of a soccer ball, or a missile, or a moon rocket flying through the air. If you take a system, such as a clock, and break it up into its constituent parts, and if you can then understand the role and behavior of each part, well then you’ve understood the clock. The Newtonian paradigm, along with other historical forces such as colonialism, birthed the industrial revolution and the way we live today. Its impact goes far beyond physics. In this view, Nature is objectified, transformed into a machine that is predictable and controllable, and we are outside it - masters of the machine, who can tinker with it for our comfort. At the heart of the Newtonian view is, I suspect, fear — fear of the unknown, the wild, the disorganized, perhaps even fear of death. Its driving imperative is security and control. As a physicist, I know that despite the beauty and power of Newtonian physics, the universe is not Newtonian. Newtonian physics is fantastically accurate and powerful at our scale of distance and speed; nevertheless, it fails in the realm of the very small, the very large, and the very fast. It is superseded by quantum physics and relativity. But it also fails at all scales in the realm of the complex. Most systems that classical physicists studied were simple, or simplified so as to be amenable to the methods of Newtonian mechanics. But overwhelmingly, real world systems such as global climate are complex, in the sense that the interactions between the parts are as important as the parts themselves. In fact, the interactions can change the nature of the parts. Complex systems are therefore not reducible to their parts. Consider the subsystems of the Earth: land, ocean, air, the polar ice caps, the biosphere, and now, modern industrial civilization, all intricately interdependent. We are still learning how to conceptualize such systems, even though they are all around us. Complex systems science is very new, and unfortunately many of the conceptualizations are still grounded in Newtonian thinking. The impact of the Newtonian view is ubiquitous in modern industrial society. The idea of the individual as the basic unit of society or economics has overtones of Cartesian atomism, an essential ingredient of the Newtonian paradigm. The chopped up, disconnected way we live and think is reductionism in a sociological context. The social organization of the suburbs, for example, speak of separation on the basis of economic status and race, demonstrate order in the physical and psychological arrangements of space and time, and indicate the desire to control the wild other in the smoothness and toxicity of the suburban lawn. I believe that our Omelas is constructed in part on the logic of the Newtonian view. But there are cracks in the edifice that is Omelas — and perhaps one of the biggest is the fact of human-caused climate change. How can science fiction writers explore these cracks, widen them to see what lies beyond? How can we walk away from Omelas? I promised at the beginning of the talk that I would connect my theme to that of the conference: suppressed histories and liminal voices. At the train station on my way from Boston to Stonybrook, I had breakfast with a sparrow. I was eating a croissant, and a male sparrow landed on my table and gave me a speculative look. I broke off a bit of the bread and flicked it toward my companion, and we ate together. In that moment, my identity as a woman, a brown-skinned Indian woman in America, a physicist and writer, all of that became irrelevant. We were a human and a bird sharing bread. It’s not that I don’t own those other labels, but I also recognize and cherish the fact that there are space-time intervals when our consciousness expands beyond familiar categories. These liminal spaces are where we can most clearly hear the voices that are suppressed — the child crying in the basement prison, the marginalized human, the unacknowledged, nonhuman other. The great science fiction writer and thinker, Samuel Delany, describes this space as a “pivotal suspension... a kind of revelation — a kind of center, formed of a play of ambiguities, from which I might move in any direction.” Identity matters enormously in our struggle for justice. Nobody can deny that. But identity is dependent upon context. It is a fluid, shifting thing; it does not have a predefined meaning independent of context. The feminist philosopher and physicist Karen Barad’s notion of agential realism reminds us that what we speak of as true is neither relative nor absolute, but dependent on the particular ways we entangle with animate and inanimate matter. Concepts such as identity arise out of our paradigms. I believe our freedom lies in first inhabiting and exploring our identities, and then going beyond them. These are not new ideas. In my own background, Buddhism, Hinduism, and Sufism have something to say in this regard. Identity — human, individual, female, male, cis, trans, white, or black — is a construct that we must acknowledge, but it can also be a trap. These ancient traditions often use negation to expand the consciousness: In the Advaita philosophy of Hinduism, neti, neti, [I am] not this, not this; “Who knows what I am,” sings the Sufi poet Bulleh Shah, “I am not fire, I am not air...”; Rumi says, “I do not know my own face.” When we recognize that identities don’t have hard boundaries, we can make space to see the other, to free and be freed. Where in science fiction are stories about people working in communities, negotiating their differences to engage with an issue? In his fascinating book, How Forests Think: Toward an Anthropology Beyond the Human, the anthropologist Eduardo Kohn relates his learning experiences living with the Runa people of the Amazon. He points to the possibility of an interspecies pidgin, the notion that semiotics is more fundamental than language, shared by humans and nonhumans alike, which can therefore enable us to participate in conversations with the rest of nature — something that indigenous peoples have long recognized and practiced. “The world is also 'enchanted,'” says Kohn. Being part of the tropical forest ecosystem “changes our understanding of what selves are, and how they emerge, dissolve, and also merge into new kinds of we.” It is particularly fascinating now that we are beginning to acknowledge that other species have language — we have started to decipher Prairie dog-ese, and Gibbonese. Ursula K. Le Guin’s 1974 short story, “The Author of the Acacia Seeds,” in which she explores therolinguistics, a term she coins to denote the study of the languages of other animals, is beautifully prescient. Science fiction itself is an in-between space. Here, anthropology talks to physics, biology talks to art, and humans talk to other beings. It is a welcome relief from the suffocating humans-only solipsism of mainstream literary fiction. My short stay in the Arctic in 2014 commenced because of a story I’d written the preceding fall, whose threads led me to my academic project. The experience resulted in a cognitive shift, a seismic displacement that allowed me to look through the cracks at what might lie beyond Omelas. I saw scientists working with Native elders as equals. I learned that tribal ways of knowing are invaluable, not simply for filling in gaps in known science, but also because of their potential to expand, even provincialize science as we know it. In the liminal space of the Arctic sea ice — not land, not sea, neti, neti — I realized the preeminence of localness and geography in shaping minds, cultures, and lives, a fact that the fossil fuel era has allowed us to forget. Indigenous peoples of the world still remember, for the most part, what it is like to belong to some place. Perhaps the countries beyond Omelas lie closer than we think. Complex systems like social systems, climate, and weather have features that simple systems lack. The meteorologist Edward Lorenz, who discovered that weather was a chaotic phenomenon, declared poetically that a butterfly flapping its wings in the Amazon could cause a tornado in Texas. Not all complex systems are sensitive to initial conditions, but perhaps it is safe to say that in many of them, a small shift in a key parameter can cause a large-scale change in the system as a whole. In the beginning scene of the epic Ramayana, a king on a hunt misinterprets the rustling of leaves, and commits an error that will have consequences for generations to come. If an epic can turn on the rustle of a leaf, then kings and scribes ignore the humble leaf at their peril. Post-Newtonian science and traditional wisdom both tell is that we are intimately connected, in time and space, to our physical environments and to other beings. If no one thing has supreme importance in the scheme of things, then we must relinquish the idea that some lone hero will save us. In fiction as in life, perhaps, this is the age of a million heroes. What then might post-Newtonian science fiction look like? With the participation of writers from around the world, raised in different cultures and climes, including voices we have not heard until recently — Native American writers for example — we are finding multiple answers to that question. We are, I hope, finding pathways out of Omelas. I’m going to end with a recognition of the unacknowledged multiple beings who share our world. Our survival on this beautiful blue planet is inextricably entangled with theirs. What befalls the wolf and the blue whale befalls us in the end. Paraphrasing John Donne: Never send to know for whom the wolf howls. She howls for thee. 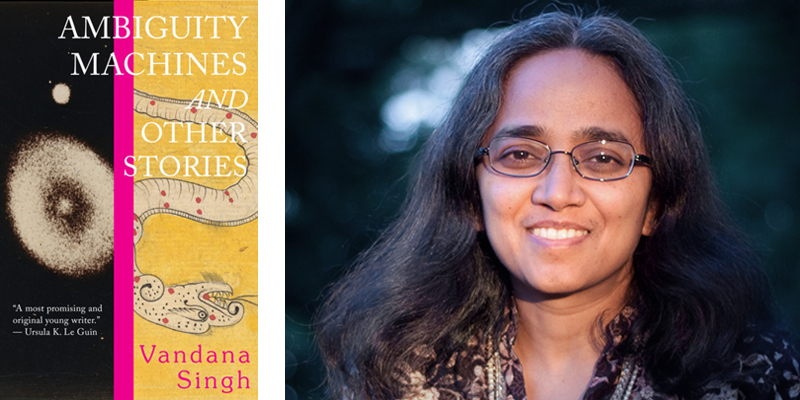 Vandana Singh was born and raised mostly in New Delhi, India, and currently lives in the United States near Boston, where she teaches physics and writes. Her short stories have appeared in numerous venues and several Best of Year anthologies including the Best American Science Fiction and Fantasy, and she is a recipient of the Carl Brandon Parallax award. She is the author of the ALA Notable book Younguncle Comes to Town, and a previous short story collection, The Woman Who Thought She Was a Planet and Other Stories. Ambiguity Machines and Other Stories is her most recent book.